All praise is due to God, the Creator of the universe, who says in the Glorious Qur’an: “… ۖ وَرَحْمَتِي وَسِعَتْ كُلَّ شَيْءٍ ۚ فَسَأَكْتُبُهَا لِلَّذِينَ يَتَّقُونَ “My Mercy embraces all things that I shall write for those who are pious.” Peace and blessings be upon our beloved Messenger, Muhammad (a.s) which he says: “Whoever fasts Ramadan with firm belief and conviction all his past sins shall be forgiven.” May peace and blessings be upon his family, upon his companions and upon all of those who follow his path with piety until the Day of Judgment. If in this world exists something good and with a great value, which it cannot be described in words, it certainly is the month of Ramadan. Because, how much we speak of its virtues, blessings, mercy, value and all its benefits which the month of Ramadan has, to benefit us in this world, and specifically in the hereafter, we can never be able to count them all. There is no grater honor and appreciation for a worker, for his work to be taken by His Supreme Lord Himself and this work is fasting. 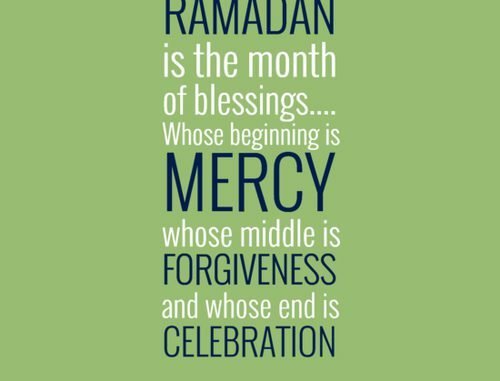 Brothers and sisters in Islam, we have entered the month of Mercy, the month of forgiveness of our sins, the month where our prayers are answered, the month of multiple rewards , the month of physical and spiritual cure, the month of salvation and blessings. Use this month therefore in good deeds, with fasting, with prayer, with reading the Qur’an, with charity, with harmony and forgiveness with one another before this month ends. Without a doubt the lost and the depressed is that person, which within this month does not receive God’s Mercy, forgiveness and salvation. O you who believe, Allah has filled this month with all good things. From the first night of Tarawvih, before we started fasting Allah has opened the doors of his bounty for those, who have firmly intended to be devoted to this month of Ramadan. First: In the first night of Ramadan, God sees my ummah and that which He sees He will never punish him. Second: The smell of the mouth of the person who is fasting is better then the smell of a misk. Third: The Angels ask forgiveness for them day and night. Fourth: Allah orders His paradise saying: Prepare and adorn yourself for my slaves. Fifth: In the last night of Ramadan He has forgiven all. How can a wise person run away from all these blessings and verily, in what people we shall find all these blessings but in the umma of our Prophet? O people! Let us not lose these chances, because none of us know how long we shall live. No one of us knows nor has guaranteed whether we will reach neither the next Ramadan, nor anyone of us knows whether we’ll be a live to fast tomorrow. Therefore, fasting is prescribed to every Muslim, and we have to understand that God does not have a need for our fasting; rather we have a need for Him and ourselves that we may receive a reward from this. Whoever fasts in faith, with a firm conviction in worship which he performs, at the end of fasting that person will be clear from his sins. How many mistakes have we made and still do daily! How many times perhaps we have angered God, with our tongue, with our eyes, with our hearing, with our deeds! How many times we have broken our covenant with our God and how many of our duties we have neglected? With what else we can erase and clean these sins but with fasting?! God Almighty desires from His slaves to sacrifice in this world in order to attain a better life, whether in this world or in the hereafter. And to sacrifice for the sake of God it does not mean only to die in the path of God, as some people think, perhaps this is the easiest sacrifice, but rather to LIVE in His path and that is the ultimate sacrifice. This is true indeed and today that is what is required, especially during the month of Ramadan which a Muslim should live in the way of God. The month of Ramadan shows us that a Muslim wishes to live in the path of God or if he chooses otherwise. Every one of us should practice one month straight a life of a true believer, while fulfilling completely the duties towards God, while abstaining not only from food and drink, but as his tongue, anger, eyes, hearing and so on… In order that after Ramadan it will be easier to continue living in the path of God. This is, therefore, the purpose of fasting, which God has made it obligatory upon us: “In order that you may be devoted”, so you become disciplined. Brothers and sisters let us not forget that every good deed that we do during this month that will be compensated in reward many more times than any other month, therefore let us increase in good deeds. Perhaps it was Allah’s decree that the project to expand the parking lot is to be realized these first days of Ramadan, in order that Allah may reward and multiply our contributions in order that we may fulfill and complete this project which is an utmost need for the functioning of this Masjid and for the accommodation of our growing ummah in this area. Do not hesitate to give from that which Allah has given to you, because for surety you shall be compensated and prosperity and its goodness it will never cease as long as you’re alive in this world, but more importantly in the hereafter. That which you give for the sake of God, it will lighten your faces during that day when you’ll give an account. Therefore, GIVE, and may Allah increase you in wealth and health and may Allah pour His mercy upon you. May Allah reward you with every good thing in this world and in the hereafter. AMIN!